This black Irish cap prominently features an embroidered Trinity knot along with the word Ireland in the green, white and orange colors of the Irish flag. The Celtic cap is 100% cotton and has a Velcro strap for size adjustment; the one size will fit most adults. 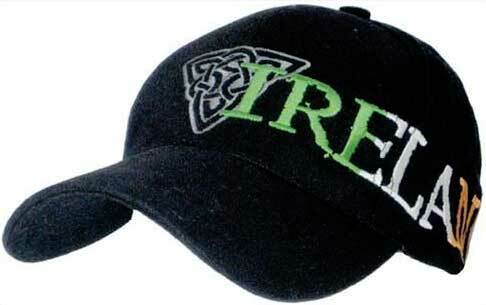 This Irish ball cap is received with a Celtic knot history card, complements of The Irish Gift House.